Hello guys, today I am going to do an in-depth write-up on a card which is being used a lot at the moment, the Knight! As you can easily notice, since last 2-3 game updates, people have been using Knight a lot more than ever. Picking the Knight as a topic at the moment is not a bad idea at all, right? Players usually wonder “Why should I use the Knight? 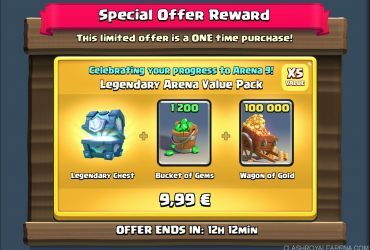 Why not Ice Golem, Lumberjack, Mini P.E.K.K.A or Valkyrie?”. This is because they all have different roles. Also, using Knight gives you some great benefits which can’t be found from any other troop. Hopefully after reading this guide, you guys will love the Knight like me! At the first glance, Knight seems like a boring card with moderate HP, moderate damage, moderate hit speed and no special ability. He is totally out-shined by other cards with cool abilities and stats. He is always “okay” in every meta, floating in the middle due to the appearance many new cards. With an incremental increase in usage of the Knight, many are starting to realize not only its defensive capabilities, but also its defensive value as a card! The Knight, formerly viewed as a weak vanilla card, has proven itself to be a defensive warrior. As an advocate for the Knight since the Giant-Poison meta (in my opinion the meta he was most effective in I’m baffled no one used him then) this guide will be sharing what I’ve compiled using him for half a year. In an attempt to bring constructive high level strategy, this guide will attempt to be as thorough as possible, hopefully encompassing any Knight strategy accumulated to date. The Knight is lucked from the very first Tutorial Battle (Training Camp). He is a melee troop with moderate HP and moderate damage. He is single-target troops. When he is defeated, his sword falls and gets embedded in the Arena’s ground. 18/5/16: Increased the Knight’s hitpoints by 10%. 12/12/17: Decreased the Knight’s hit speed to 1.2 seconds (from 1.1 seconds). 12/2/18: Balance Update decreased the Knight’s hitpoints by 6%. Hey, I’m SamSung, currently residing in Reddit Delta with 5100 trophies as a lvl 11. I run a 12/0/6/2 2.6 spell cycle Deck. Can also play Bandit Mortar cycle (I’ve just gotten my 5th Challenge 12win streak with this Deck, this time a 12-0 but with Rocket for Miner, give it a go!) (*edit: this was a couple of month ago, before Night Witch release and Bandit buff) and really any form of cycle Deck with fair success. Don’t really like running completely meta decks, will usually change them up a little to spice the game up a little and to suit both the situation which my trophy range finds itself, as well as personal playstyle preferences. Favorite card right now would evidently be the Knight. I also personally find Miner, Princess, Tornado, Goblin Gang & Ice Spirit to be really strong cards that suit my playstyle very well! 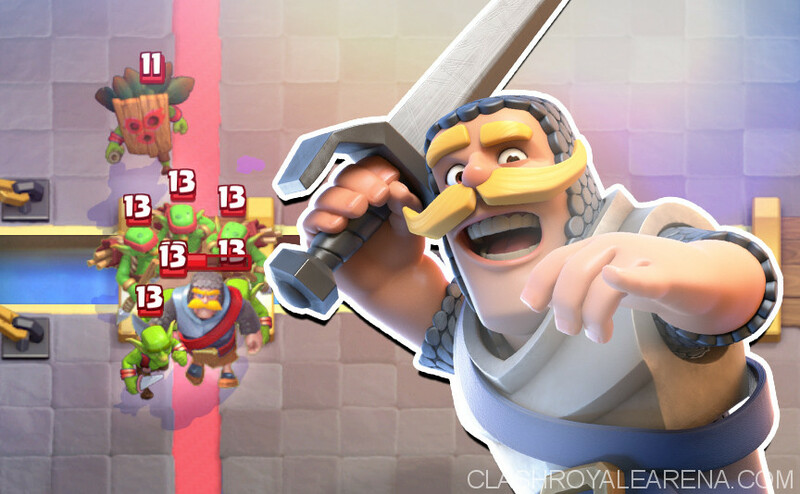 P.E.K.K.A, Rage, Lumberjack, Battle Ram and Bandit, although not the most competitive cards, are definitely loads of fun. I highly recommend those who haven’t to try them, as a lot can be garnered from giving these underused cards a go! Cannot function while playing beatdown. Would say I’m fairly good at the game ~should be I’m addicted~ , but not near that competitive top tier ~I’m garbage~ . Can win with kind of underleveled cards (average is 12/9/6/3) and consistently get 12 wins in classics, also will average top 15 in 1k tourneys. Personally a fat Canadian high-schooler struggling to survive the rigors of the international baccalaureate. The Knight is a three Elixir common melee unit unlocked at the start of the game. The Knight boasts a 1.1 second hit speed, and has a medium movespeed, both average stats. It’s in fact the first card you’re introduced to in the Tutorial, and is regarded by many as the most ‘vanilla’ card in the game, meaning it’s mechanically the most simplistic concept in the game. At tournament standard the Knight holds 1,399 health. This is a median between the Ice Golem & its 1100 hit points at tournament standard, and the Valkyrie and its 1548 hit points, all of which are commonly classified as mini tanks. This high hitpoint pool makes the Knight immune to most, actually all, spells in the entire game! Looking at the lighter spells such as Arrows, Log, & Zap, the Knight can withstand them with ease, and will barely be dented. Heavier spells, such as Fireballs & Poisons, will also deal minimal damage to the Knight, and he’ll persevere through with ease. Even the heaviest spells in the game, Rocket and Lightning, cannot fully deal with a Knight, who will survive through both! In fact, with its cheap cost and High hitpoint pool, it can often act as a Lightning rod to fragile ranged “glass cannons”, such as Musketeers & Electro wizards The Knight also boasts 144 damage per second, similar to the damage output a Musketeer, with its 160 damage per second, has. Such is decent, however not enough to be considered a high damage output troop per say. the Knight should not be used as a primary tank killer in any Deck. With these stats, although some may still think it’s a viable win conditiondumbass , the Knight shouldn’t be used as a primary win condition in a Deck. Its medium move speed paired with its relatively low hit points (comparing to other tanks), combined with the fact that it’s a troop targeting troop, makes it very hard for it to reach the Tower. Distraction units such as Skeletons & Ice Spirits, both one Elixir, can deal with a lone Knight. Furthermore, the Knight’s melee nature makes it so that he’s unable to rid the board from air troops so effectively, making him poor air defense troop. Albeit this, he shouldn’t be relegated to useless against air troops, as he can provide some support in dealing with them, more on that later. Furthermore, on offense, the Knight will struggle to deal with long ranged troops such as Musketeers, as his slow speed will give the Musketeer ample amounts of time to whittle him down. However, it must be stated that an ignored Knight will take roughly 40% of a Tower, so never ignore one! The Knight’s primary role in a Deck, with his spell resistant nature and surprisingly large hitpool for cost, along with a decent hitspeed, makes him an ideal defensive troop, but more on that later. So, for starters, to reiterate, the Knight should not be used as a decks focus primary win condition. His slow speed makes him vulnerable for longer periods of time. Paired with his hitpoint pool, although relatively large considering Elixir cost, still isn’t large enough to pose a threat to towers. His troop targeting nature, for better or for worse, makes it tough for him to reliably reach a Tower. His low damage per hit makes it so that unlike the likes of P.E.K.K.A and Sparky, one hit isn’t going to make a substantial difference in a game and isn’t all you’re looking for when pushing with a Knight. All in all, as most reading this paper should know, the Knight simply wasn’t designed to be used as a primary win condition, and should not be used as such! Furthermore, due to his melee nature, he evidently shouldn’t be considered as air defense. Rather, where the Knight shines is the defensive end of the game. The Knight can fill several roles as a defensive card, and his cheap cost thus makes him an absolute stud on defense. The first and foremost defensive role the Knight will fill in a Deck is as a stagger card! The Knight, with his high hit pool and low cost, is a great card to play to halt enemy pushes, or stall them further so that towers and high damage sources such as Cannons & Electro Wizards* can inflict an exponentially larger amount of damage. The Ice Golem used to fit a very similar role a few metas ago. However, with the inability to deal damage, along with the nerf to the Mega Minion, a card which synergizes very well with it, added to the decrease in usage of Skeleton Army, has relegated the Ice Golem to a secondary option as a stagger card, giving the Knight the spotlight. Stagger cards hold immense defensive value! Due to the ability to take several hits from opponent troop targeting troops, providing ample amounts of time for the Tower to whittle down any threat, they can essentially be played as panic cards in most any situation, and still get the job done. The Knight, although not a splash unit, with the support of the Tower, can deal with the likes of skeleton armies and Goblin gangs. To add to this, the Knight, a melee troop, can completely mitigate damage from, with the support of the Tower of course, Bats, Minions, Mega Minions Baby Dragons, and when played correctly, most of a Minion Horde! However, this concept doesn’t only apply to when towers are supporting the Knight. The Knight has such a high hit point pool for his cost, that he can stagger several cards long enough to deal with any tank distracting Tower aggro. During the Goison meta, when players would rush in with Giant Mega Minions, for a long time considered a busted push, I would casually play my Cannon and support it with a Knight on the Giant. Back when the Mega Minion was the strongest card in the game, it still took 6 hits to kill a Knight. This gave the Knight, Cannon and Tower more than enough time to deal with the Giant, and add an Ice Spirit to the Mega Minion and that was an easy positive trade. essentially in any situation where one is unsure what to play, or doesn’t have a direct counter in hand to whatever is coming at him, the Knight is a great card to simply plop down and give the Tower time to deal incremental damage, significantly mitigating damage. The Knight, essentially is able to act as a panic card. In most scenarios, playing a Knight will result in a significant amount of damage avoided. This applies to all mini tanks, and is the reason why they’re starting to become more and more popular. This was the most impactful factor in what made the Ice Golem so popular a few month ago, his ability to stagger damage for so cheap made him a defensive powerhouse. The same applies for Knight, and seeing as he’s able to inflict damage he becomes more versatile; hence the higher use rates for the Knight in comparison with the Ice Golem. Now in certain cases, the Knight wouldn’t be the best option as a stagger card. Both the Skeleton Army and the Goblin Gang are much more effective stagger cards in theory, as they deal a exponentially larger amount of damage and can tank more hits from several heavy hitters including P.E.K.K.A & Prince. However, as many know, they are fundamentally extremely susceptible to all spells in the game. This makes them less reliable stagger cards, as one can instantly Log them out for a quick +1 trade. This is the fundamental reason why the two tend to be used in conjunction. When the primary counter to one has been used, or baited, the other can hypothetically be played and gain unimaginable value. However, to add on to this, this is also a reason why many bait decks use the Knight. Assuming the opponent holds several counters to swarms and has been able to effectively keep them in their hand, the bait player has the option to play the Knight as a spell resistant stagger defensive card. Several deck archetypes, especially those that focus on cheaper high damage win conditions. Decks that use Graveyard or Goblin Barrels as win conditions will commonly use the Knight as a mini tank. Being a cheap mini tank for these fragile heavy hitters makes the Knight a great option to take Tower aggro away from said win conditions. However, what makes the Knight a better option as a mini tank to say the Ice Golem is that the Knight, remaining relatively cheap, offers a threat in his own right. As aforementioned, if the Knight were to reach a Tower, he would deal significant damage to it; this is a trait the Ice Golem does not possess. With a push consisting of a threat on the Tower in the form of the Graveyard/Goblin Barrel, as well as the threat the Knight provides, a dual layered push. This is a concept I’ve seen discussed a lot, yet I haven’t been able to find a concrete strategy post dedicated to it. Essentially this concept is as simple as it seems, duel layered pushes are those that provide two separate layers in a push, both of which are a Tower threat in their own right. They’re usually cheap, and will commonly rely on having one of the threats directly reach the Tower. The most basic and original dual layered threat push I can think off is the retro Miner Goblins push. Both the Miner and the Goblins had to be answered, and for 5 Elixir this used to be a quick threatening push. The Knight acts as a tank threat for either the Goblin Barrel or the Graveyard. This is especially effective with the Graveyard as it’s a card that requires precise cards and positioning to counter. The more difficult it is to defend the threat the Knight is tanking for, the more effective and lethal the push becomes. Now, although most decks that rely on the Knight as an offensive mini tank will use him as just that, some decks, especially those more cycle oriented that include the Knight, will use him as a runner card. A ‘runner’ card is a card in a Deck that is used on defense and transitions into offensive play after having already garnered value defensively. For instance, let’s assume a Knight was used to counter a naked Musketeer, the remaining Knight could be paired with a Hog Rider to form a counter push of sorts. Speaking of which, Hog Rider Cycle Decks, alongside Siege Cycle Decks, are most notorious for utilizing the Knight as a runner. Both use him defensively when needed, and counter push with him acting as a mini tank for the damage source of each respective Deck. Three Musketeer decks that still use the Knight will also commonly use him as the Deck’s runner. The Knight, being a primarily defensive card, boasts several beneficial defensive interactions in which it would be recommended for one to play their Knight, this section goes over what specific cards the Knight is strong at shutting down. As aforementioned, the Knight is fantastic against ranged support units! These include the likes of Electro Wizards, Musketeers as well as Archers & Bomber. Without Tower support, the Knight is able to completely shut down almost every ground based ranged troop in the game. Furthermore, the Knight is not only able to shut down 1 ranged support units, but he can shut down 2, as long as the combined cost of both is 7 Elixir or under. This includes the likes of a Musketeer & an Ice Wizard, or an Electro Wizard paired with a Bomber/Archers, or even an Executioner with Spear Goblins. Placement for such is pretty simple. just place the Knight on top of said ranged units. With the Executioner one is going to prefer placing the Knight to the Executioner’s sides to ensure his axe doesn’t proceed to chip the Tower. Now, it must be mentioned that there are a couple of ground based ranged troops the Knight does struggle with. The Witch, depending on how many Skeletons she has spawned, can be a challenge for the Knight, he’ll usually be able to take her out, however he won’t be able to take out much else. However, the only ranged support troop the Knight truly isn’t able to shut down without Tower support would be the Bowler. With his high HP, decent damage and knockback effect, without Tower support, the Knight struggles against a Bowler. However, his high hit point pool makes it so that by the time the Bowler has finally bowled through the Knight, whatever push the Bowler was supporting has died down. Against the likes of high damage outputting troops such as heavy swarms & high single target damage troops, the Knight will be able to deal with most as long as Tower support is available. Looking at ground based swarms, the likes of Skeleton Army & Goblin Gang are the foremost swarms. For both, as long as the Knight is played in the middle of the arena, with Tower support, he’s able to comfortably counter both and push on with roughly 60% HP left. Without Tower support the Knight isn’t able to take out a Skeleton Army, however is just able to take out a Goblin Gang. For the Goblin Gang simply play the Knight on the Spear Goblins so he takes them out first, then leaving him with 3 shank Goblins. It also must be mentioned playing a Knight against a squad of Barbarians will take them out assuming Tower aggro is present..
As per heavy hitters, there are 4 primary heavy hitters in the game, which are as follows: Mini P.E.K.K.A, Prince, Elite Barbarians, P.E.K.K.A. With the Mini P.E.K.K.A, a lone Knight can easily shut one down with Tower support. Without it, one is going to have to use 1 Elixir Skeletons to allow the Knight to shut down the Mini P.E.K.K.A. With the Prince, Knight isn’t going to be able to fully shut down a Prince, and the Prince will get a hit on the Tower, regardless of Tower aggro or not. Albeit this, once again, adding 1 Elixir Skeletons allows the Knight the fully shut down a Prince, with or without Tower aggro. Examining Elite Barbarians, the 6 Elixir maniacs can comfortably be shut down by a Knight paired with any single troop in the game, this includes either of the one cost cards. Just ensure the Elite Barbarians are pulled to the middle of the arena, to where both towers have aggro on them. However, if Tower aggro is not on the Ebarbs, things become a little more complicated. Without Tower aggro, the Knight is going to have to act as a mini tank for whatever DPS troop one has to take out the Elite Barbarians, this can include the likes of Goblin Gang, Cannon, Mini P.E.K.K.A, Minions etc…. 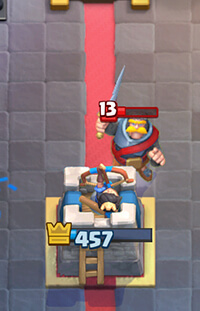 It must be quickly noted that if the king Tower is activated and all 3 towers are active, a lone Knight can take out a Prince or a pair or Elite Barbarianson his own. 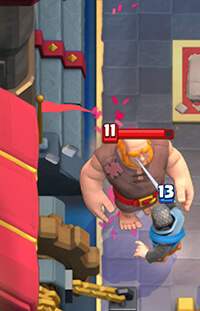 Nonetheless, the P.E.K.K.A acts similarly to Elite Barbarians when assessing interactions. With Tower aggro, a Knight paired with 2 Elixir shank Goblins can completely shut down the masked lady. It should be mentioned that before the Skeleton patch, such was doable with 1 Elixir Skeletons. Regardless, if one were to find himself in a situation where the P.E.K.K.A doesn’t have Tower aggro, he’s going to want to play the Knight paired with a very high source of DPS. This can be a swarm such as Goblin Gang, Skeleton Army, Minion Horde amongst others, or it can be a tank shredder. My personal favorite is the Inferno Dragon. It’s fantastic against tanks, and even if they Zap it the Knight will stagger the P.E.K.K.A for long enough to where the Inferno Dragon will recharge up to maximal damage. As a quick bonus, the Knight can survive a Sparky shot, and thus can counter a Sparky with Tower aggro, but will struggle against one without it. Threat cards have recently been surging in the meta. Although Ebarbs & The Prince/Dark Prince have dropped quite noticeably in effectiveness since their glory days, the likes of Night Witch has been dominating the meta for quite some time, Bandit and Battle Ram seem to be hot cakes right now, not to mention the Hog has always been the staple threat card for quite some time. With or without Tower support, a Knight can comfortably shut down a Bandit, he’s the Bandit’s hard counter, and in a meta where the white haired thief is dashing left right and center through the arena, the Knight becomes very valuable. Against the Battle Ram, the Knight is fantastic against the Barbarians themself, but he can’t stop the Ram from connecting to the Tower on his own. Adding either of the 1 cost cards completely shuts down the Ram for a neutral trade and a half health Knight on the counter push. However, if Tower aggro isn’t on the Ram, one is going to need to use 2 Elixir Goblins with the Knight to be able to shut it down. The same applies for the Hog Rider. 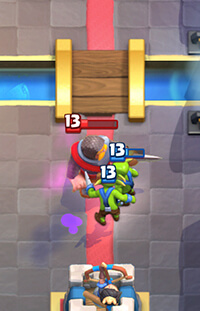 The Knight paired with 1 Elixir Skeletons limit the Hog Rider to a single swing with Tower support, and without it a Knight paired with 2 Elixir Goblins also limit the Hog to the same results. Now, seeing as the Night Witch spawns an air troop,something the Knight can’t reach, it becomes a little tougher for him to deal with her. With Tower aggro, a lone Knight can deal with her just fine, as he staggers the Bats long enough for the Tower to snipe them off the field. However, behind a tank of sorts, the Knight Witch will get the better of the Knight. Pairing the Knight with Minions can shut down the Night Witch while providing one with a half healthed Knight and 2 Minions on the field. Seeing as there isn’t anywhere to really cover the Dark Prince, he’ll be covered here, as he’s most akin to a threat card. The Dark Prince is in the same boat as the Bandit, to where a lone Knight will completely shut one down, with or without Tower support. Currently the Dark Prince is complete junk, and it gets outclassed in almost every way by the Battle Ram in beatdown & control decks (siege decks use non), it’s in dire need of another light hitpoint & damage buff from the Supercell team to be viable. Depending on the tank,the Knight can either be a fantastic or terrible answer. Note: Before progressing it must be mentioned that all tanks are assumed to have Tower aggro in this section, as after all they’re tanks, the main purpose they provide is to yield Tower aggro. The Knight is fantastic against troop targeting tanks such as the Valkyrie & the Giant Skeleton. His high hit point pool makes him fantastic against these low damage dealing tanks, and stalls them for long enough to be wiped by the Tower. It’s suggested that when countering a Giant Skeleton, that the Knight should be played behind it to allow it to escape from it’s death explosion. As per the building targeting tanks, the Knight isn’t the best option. 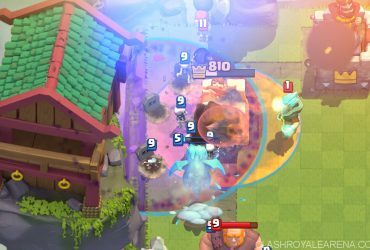 Against the Giant & Royal Giant, pairing a Knight with an Ice Spirit, as well as a cheap high damage per second unit such as 1 Elixir Skeletons, Bats or shank Goblins can lead to most damage mitigated. The Knight should simply not be used to actually counter a Golem, period. When looking at troops that spawn on one’s Tower, the Knight is fairly effective against those too. 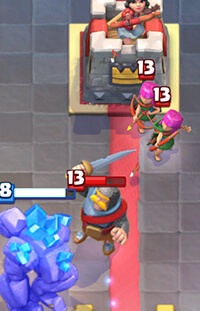 The 3 troops that spawn anywhere on the map are Miner, Goblin Barrel & Graveyard. The Knight is probably the best counter to the Miner in the game. He comfortably takes on a Miner 1 on 1 without Tower aggro, and his spell resistant nature makes him barely hindered by the Poison commonly sent in with the Miner. Predicting the Miner placement is the hard part, but if one is able to do so, it’s a guaranteed counter. The Goblin Barrel is also going to require some predictions. If the Goblins from the Goblin Barrel are all spawned on one side of the arena Tower and one was able to guess such, the Knight will completely shut down the Goblin Barrel. However, if the Goblins are split, then the Knight isn’t going to be a great counter. However, if one must, the Knight should be played on the bottom Goblin. Looking at the Graveyard, an unsupported Graveyard can easily be shut down by a Knight and the Tower should take minimal damage (there’s no set number due to the RNG factor of the card). If the Graveyard is being tanked for, which it should be, then the Knight should still be able to hold his own. His high hit pool allows him to both be spell resistant and tank several hits from the constantly spawning doots, and his decent hit speed allows him to rid of them fast. The problem is that with the RNG factor of a Graveyard, one skeleton may be left alone on the other side of the Tower and deal over 500 hundred damage. Pair the Knight with a the Log or a Zap to ensure the Graveyard is countered. Placement for the Graveyard is pretty simple, just play the Knight in the center of the Graveyard. Timing against Graveyard is important, it’s ideal the Knight comes down as early as possible, as taking an extra second to spawn him will make a significant difference in the amount of damage one takes from the Graveyard. Probably the most underrated synergy in the entire game, the Knight paired with either of the 1 cost cards create an incredible defensive combination. The Knight, in conjunction with either of the one cost cards, can comfortably completely shut down a pair of Elite Barbarians up to 2 levels over leveled. The combo can also shut down a Minion Horde completely. The only troop targeting air card the Knight struggled at shutting down was a Minion Horde, and spending the extra Elixir, assuming Tower aggro is available, allows him to overcome the minion squadron. Simply play the 1 cost card of choice in the center of the arena, allow it to do it’s thing (the Ice Spirit freezes and harms the Minion Horde/the Skeletons split in the middle, leading the Minion Horde under the aggro of both towers), and proceed to play the Knight right in between the two arena towers 2 tiles above the king Tower. If no idea counter is available to an incoming Giant or Hog Rider, a Knight paired with either of the cards limits either to 2 hits on the Tower, while a Knight paired with both cards limits them to no hits on the Tower, providing a full health Knight on the counter push. A Knight paired with both of the one cost cards can counter both a Goblin Barrel or a Miner. The combination of the Knight with both one cost cards, along with some form of high damage output, form a stable defense in most cycle decks in the game. Although more costly than the afore mentioned synergy, a Knight paired with either Goblins or Bats also form a sturdy defense. This combination can counter all the troops countered by the previous defensive combination (Minion Horde, Elite Barbarians, Goblin Barrel, Miner), while also shutting down a tanked Graveyard. Furthermore, this combination proves to be much more effective in match scenarios. The Knight, being a cheap tank, and the Goblins/Bats being a damage source, lead to a fantastic combination. This will be a re-occurring theme within this synergy section, any form of DPS synergies effectively with the Knight. The Knight offers cheap tank-age for the damage source to have more time to deal damage. The Knight paired with these 2 cheap high damage sources is the most basic form of this concept. The combination of a Knight with Bats or Goblins also form a much more threatening offensive combination. Assuming the counter to the Bats or Goblins, Zap/Log respectively, has been countered, this quick 5 Elixir push can prove very threatening for an unsuspecting opponent. The high damage output of the Bats/Goblins along with their fast move speed make them an immediate threat. Just ensure the Knight is tanking for either of the fragile 2 Elixir troops. All concepts stated here work for Minions & Goblin Gang respectively. The concepts stated here work with any defensive buildings, I’ve personally found it to be most effective with the Cannon and Inferno. The Knight paired with any of these buildings are an ideal way of shutting down most beatdown pushes. The building deals with the respective tank, while the Knight takes out, or at least staggers the support troops. With the introduction of the Night Witch, this combination isn’t as effective, but regardless it’s a very strong synergy. The Knight paired with both 1 cost cards and a Cannon was the ideal way of shutting down any goison push during that meta. Referring back to the claim made in the Knight + Ice Spirit/Skeletons section, having a Knight, both one cost cards, and a source of high damage output create a sturdy defense, and the Electro Wizard/Archers act as that high damage source. With the Knight acting as a stagger card, these ranged powerhouses accumulate an incredible amount of damage outputted. Cards such a Musketeers, Mega Minions, Executioners work just as well as damage sources, and provide pros and cons in certain areas. Pairing the Knight with any of these ranged support troops, alongside a building can stop multi layered pushes. For example, a Knight, Archers and a Cannon can shut down a Giant Graveyard Poison push for a +5 trade. Simply play the Knight in the center of the Graveyard, the Archers on the outskirts of the Tower, and the Cannon at a 4/3 plant to deal with Giant, and you’ve dealt with the supposedly threatening push, only taking roughly 400 damage (depending on Graveyard RNG). Although the three Deck archetypes are played completely differently, the Knight fills a similar role in all. The Knight, being a cheap mini tank, provides a cheap option to tank for all of the listed win conditions. With the Three Musketeers in particular, the Knight has the added advantage of acting as a Lightning rod for the Three Musketeers when used defensively. Paired with the Tower, and only one Musketeer ends up dead (the Knight tanks the Lightning rod and survives with roughly 10% HP). A very simple yet effective synergy, the Knight is a fantastic cheap tank to either of these win conditions. This synergy was already touched upon previously, and so it won’t be re-iterrated. Just ensure that with the Goblin Barrel in particular, the opponent’s counter isn’t in cycle. It’s vital that players are aware of each and every individual card in the game, it’s purpose, functionality, and common interactions with other cards if they wish to become a holistic competitive player, as such provides them with the knowledge necessary when building, playing and countering certain decks. This guide’s intent was to provide players with every and all information they’ll need to know regarding the Knight, essentially acting as a hub for all strategy Knight related. This guide will be updated as time goes on and more is learnt regarding the game to ensure that it stays true to the preplaced title. Please let me know if I missed anything, got something wrong, or if something isn’t very clear, I’ll be glad to explain it. Regardless, thank you again for reading this and hope you’ve gained something new, an upvote would ~obviously~ be appreciated, I need to feed my ego some more. Note: Special thanks to the Reddit Alpha Clan Family for supporting the completion of the report. In particular thank you Dylan for playtesting certain interactions with myself, and SML, ZigZag, drquicksilver, dharanikota, Ghostly Dino, Dr Willow, Ben Elmore, Calipao, Fasweder, Sarima amongst others for reading over and editing/providing feedback!